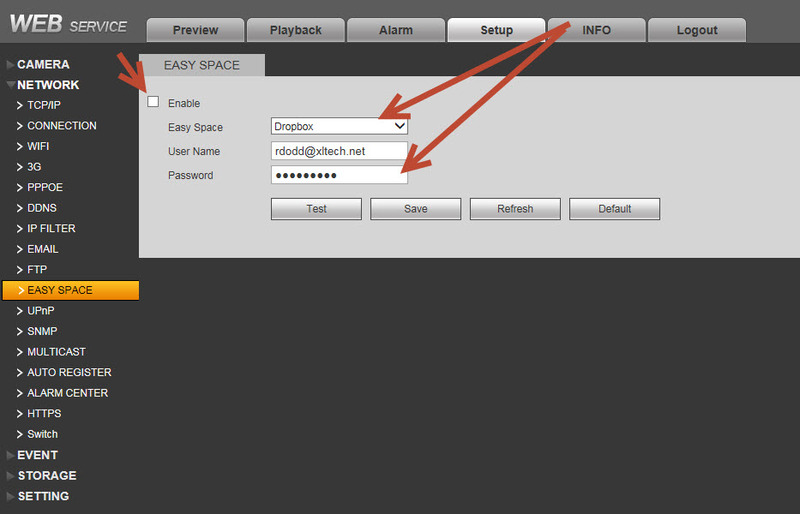 HomeSecurity Camera Support ForumNVR (Network Video Recorders)Email not working on events. Email not working on events. When a motion event happens the view switches to the correct camera. However, email does not get sent and nothing is added to my Dropbox account. When I originally set this up it was sending me an email and it was sending me a picture file as an attachment. This is when the issues started. The first thing that was happening was the snapshot attachment only displayed the top 10 pixels or so and the rest of the image was blank (see attached). Then it stopped sending me emails all together and now when an event occurs I do not get an email, no attachment and no file is stored in my dropbox. When I try a test of the email it comes in fine. When I test the set up of the dropbox it comes back successful. I know that the event is firing because the display is changing correctly but for some reason it no longer sends an email when the event occurs. 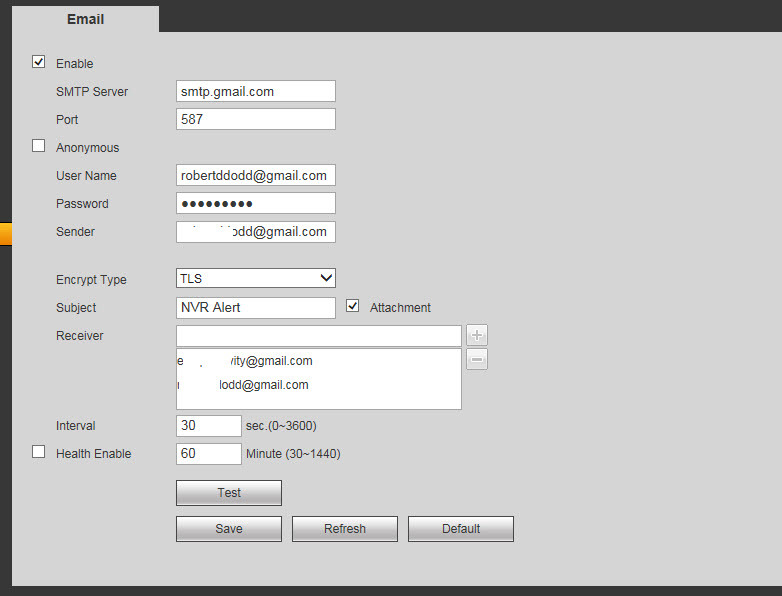 Like I said when I test send an email from the NVR it works fine. I have been through the forums and documentation and could not find a way to resolve this issue. Here is an update. I rebooted the NVR to see if that would solve the problem. Now I no longer get the display to change when the even it fired. Still no email and still not files in drop box. I beginning to think that this is an issue with the NVR now because these issues are very random. Now since the display is not changing I have no idea if the even is even firing. Good day rd I would default your detect and email and start your configuration all over. Make sure that your record is set to schedule and the MD is selected in the schedule page, the configuration is different when not using our EL series cameras just log into each camera and make sure motion detect is enabled and configured. Here is a great article on the set up. can you try using port 465 and encrypt type to SSL. On the easy space I will look into the issue first thing Monday morning. Have a great weekend. Secondly, you stated ” the configuration is different when not using our EL series cameras” I am using IPOB-EL3MPIR50 Camera’s and as I said in the last message the motion was working and then just stopped. Now I get no motion, no email, no attached image and the tour does not change to the motion camera. I have checked and the camera is set to detect motion so I believe it’s an issue with the DVR but I have no way to debug this since I get no errors and there is nothing in the event log. Good morning rd, if the NVR was sending you the email alerts previously then the NVR is fine it may be a settings issue, like I stated before in my previous post to default the detect settings and start all over also yes if you had TP series ip cameras the motion set up is a little different but you don’t you have EL series cameras. If you are still having the same issue come Monday you can call us at tel:866-573-8878 from 9am to 6pm est so we can log in and check your settings. have a great day. Thanks for the response. I will call Monday. I cannot see how it can be a setting issues when it was working and then just stopped. Test emails always come through. Now as of today it seems to work only sometimes. That is why I think it’s a NVR issue. Right not the motion is sometimes triggered, and email will sometimes send but I get never get the attached image and the view of the cameras does not switch to the camera when it’s motion activated. It’s completely understandable why you would feel this is an NVR issue, however Gill is correct. If in fact motion detection and email was functioning correctly at one time, then the fact that it is not functioning now cannot be an NVR issue. Those functions are not hardware functions, they are controlled by the software either in the camera or the recorder. The software code cannot be changed without have the source code. Also, motion detection for NVRs functions very differently than for DVRs. With NVRs, though you can configure the settings for motion detection in the NVR, this information is simply passed along to the IP cameras. All the analytics (which includes motion detection and snap shots) are performed by the IP cameras themselves. 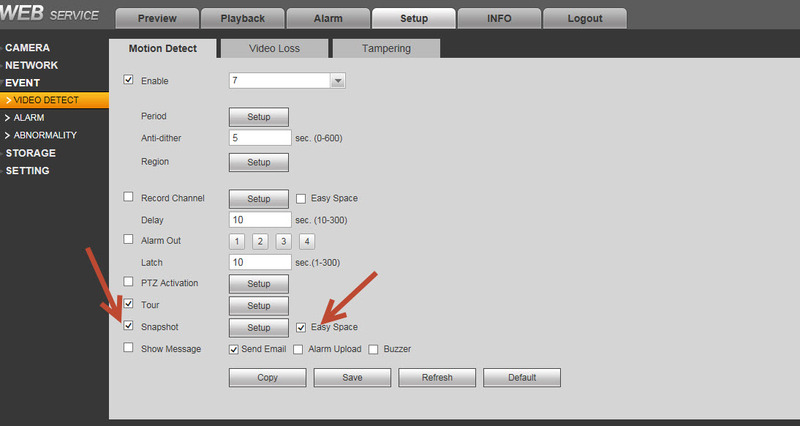 The IP camera simply sends different streams to the NVR at the appropriate time. If motion detection and snapshots are not functioning correctly then this is either a configuration issue or a network issue. With our EL series cameras, the integration is very tight because both the NVR and IP cameras come from the same factory, with our TP series cameras the integration is not as tight since the TP Series cameras connect to the NVR using Onvif protocol. In this case some of the functions need to be configured individually in each camera. Since you have all EL series cameras this is not the issue obviously. If the problem is a configuration issue then our team will be able to help. If the problem is network, they should be able to at least identify what is causing the problem. If this issue was occurring with a DVR, the functionality is very different so I would suspect a different cause. In DVRs all the analytics are performed by the recorder itself. This requires less configuration but it uses more of the recorders resources. With NVRs, this type of functionality at the NVR level would not be practical considering the megapixel resolution available today. NVRs would not have sufficient resources to handle all this, so NVRs don’t handle the motion detection or the snap shots. So if motion detection and snapshots are not working for you and if we were to assume the issue was a hardware issue, then we would have to assume that every IP camera was defective which is a very unlikely scenario. So, this is all speculation at the moment, hopefully on Monday our technicians will be able to clear this all up. We want to see this working for you as much as you do. Good morning rdoddXL I wanted to follow up on the issue you were having, can you call us at 866-573-8878 so we can log in and test you r settings? Thanks for the follow-up. It appears that the issue of intermittent motion events being triggered was because while troubleshooting the issue I moved the threshold to 40. After speaking with Scott( I think that was his name) he informed me to lower that since that dictates how long the motion has to occur before an event is triggered. I set it to 1 for testing and the alerts started working again. AWSOME thank you for the compliment greatly appreciated if you ever need additional support don’t hesitate to call us have a great day. Add Reply: Email not working on events.